For additional info on Clash of the Gods, click here. For Clash of the Gods schedule click here. Clash of the Gods has been running on The History Channel for a few weeks (Monday nights at 1o p.m. for the premier of each episode). I haven't seen the ones I am in yet, and they're not giving us DVD copies until the specific episodes run, but, having watched some episodes on Greek mythology, I'm feeling pretty hopeful about the ones on Thor (Sept. 14), The Lord of the Rings (Sept. 21), and Beowulf (Oct. 5). The visuals are very good and, although there's a bit of repetition where the series uses the same clips again and again (Zeus sitting down on his throne, for example), the overall quality seems very good. I don't get the impression that the words of the other professors have been twisted into anything they didn't say. Over at I Just Read About That, Paul concludes that all the guest experts were told to wear black, "or it's an amazing saratorial coincidence." He's right. We were told to wear black jackets and either black or white shirts and then they provided red ties. One expert, who was coming in right after me, didn't get the memo (or chose to ignore it), but they had a jacket for him and were muscling him into it as I was leaving. The History Channel producers and crew were exceedingly smart and efficient the whole way through (even when they had to call me in last minute). They had a basic script that set up what they wanted to talk about, and I was given the questions that would be asked in advance so I could be prepared. It wasn't possible to have notes because you are looking directly at the producer, who stands to the side of the camera. I had learned, when doing the National Geographic "Behind the Movie" piece for the Return of the King DVD that if your eyes move away from the producer, you look shifty, so I can't imagine how you read notes unless there's a sophisticated teleprompter, which there wasn't. What I could glean of the script from the questions made it seem pretty decent (which has been borne out so far). The writers/producers had done good work tracking down reasonable information. However, it was a little surprising how much the agenda (as opposed to the actual content) seemed to be set by Wikipedia. For example, I got asked a question about the Canterbury Charm, which I hadn't studied very much. I was impressed at how wide-ranging the inquiry was until I happened upon the Wikipedia page for Thor and found the Canterbury Charm referenced. I'm not a Wiki-hater, but the influence of Wikipedia on the script does give yet another reason why professors in relevant fields should perhaps look at the relevant Wiki entries and correct them if need be (though I, sadly, haven't gotten around to doing this yet). The producers also were surprisingly good at not trying to put words into my mouth. Producers are generally very strong willed (they have to be in order to get anything done when dealing with a lot of creative people), and they don't like you to say "no." But in one particular case, I was just not going to say that J.R.R. Tolkien used the word "orc" to refer to the Roman god of the dead, Orcus. It's just not right. "Orc" clearly and obviously comes from an Anglo-Saxon word (see Tolkien's introductory note to The Hobbit and his comments elsewhere), and while he never laid out his case for why he thought that "orc" did not come from "Orcus," my inner Philologist-Sense (like Spidey-sense, but different) agrees totally with him that the derivation from Orcus isn't right. (Note also that the orc/Orcus connection comes from Wikipedia). In the end, I said all that, and everything was fine. Overall the people who worked for KPI, the shop that produced the series, were incredibly professional, energetic and fun. Everything I've ever done for TV is always rushed, and this was no exception, but it was a good kind of rush, when time wasn't being wasted and a whole bunch of people were all bustling around doing things at once. I'm looking forward to "my" episodes (of course I'm just one of many experts) and pretty hopeful that I'll like the final result. Particularly if there really is a CGI Midgarth Serpent fighting Thor while I narrate the battle. That would finally be something my kids care about seeing. I've had to go back and re-read Gerald Graff's Professing Literature so that I can dot the i's and cross the t's for an article, and ... wow. Of the "Classical College" in the early 19th century: "Classroom concerns hardly ever went beyond the endless memorization and recitation of grammatical and etymological particularities." Endless? Is that a technical term? Is that an honest, fair, accurate historical evaluation? Of Johns Hopkins in the 19th century: "Its early work in modern languages was so wholly monopolized by philologists that it was late in developing courses in literature proper." Have we defined "literature proper"? Have we made an argument for "literature proper" as being separate from philology? No, we have not. Can we read "literature proper" in any language other than contemporary languages without philology? (You might think you can, but you'd be wrong). So is all literature before 1800 outside of "literature proper," or should we just assume that the philologists have already gotten everything right and we can just read their editions transparently? How comforting. Francis A. March's description of his class "makes no mention of the meaning of Milton's works." 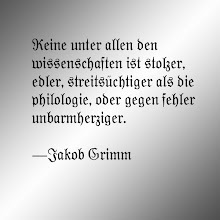 Instead, the student went through Paradise Lost line by line, "calling for the meaning of words, their etymology when interesting, the relations of words, parsing when it would help, the connection of clauses, the mythology, the biography and other illustrative matter." Now I'm not the president of the MLA, but it sounds to me that they were figuring out a lot about the meaning of Milton's work by *shudder* studying it in detail. As opposed to? Well, I assume bloviating about the "meaning" of Milton without having to trouble to tether that meaning to any actual, "relations of words." It goes on and on like this, and at a certain point I can't decide if Graff just doesn't know what he is talking about (for example, when he talks about philology or etymology), if he hasn't bothered to read the books he is criticizing (when he talks about Albert S. Cook, for instance), or if he does know and is just being tendentious to the point of intellectual dishonesty. If you want to know why your colleagues think the odd things they do about our discipline and its history, part of the answer might be that they have read Professing Literature uncritically and without actually knowing very much about 19th and early 20th century literary studies. Depressing. But on the other hand, in a single 24-hour period I topped out on a particular bouldering climb that had been impossible just a few days ago, got bitten by a snake and taught my son how to slide into a base (hint: if you do this at the beach, make sure you don't do a backdoor slide into a chunk of weathered basalt). Real life, when you're doing it right, can be more exciting even than academia. Thanks for dropping by. It was a real pleasure to work with The History Channel on the series. I contributed to the episodes on Thor (Sept. 14), The Lord of the Rings (Sept. 21), and Beowulf (Oct. 5). All the shows air at 10 p.m. on Mondays on The History Channel. I myself haven't seen them yet, so I don't know how they'll come out, but the producers asked good questions and listened to my answers, so I'm pretty hopeful that the episodes will be good. 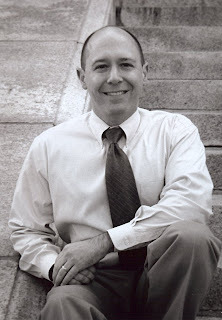 I'm Professor of English at Wheaton College in Massachusetts, where I teach Old English (also called Anglo-Saxon), Middle English (what Chaucer spoke), fantasy, science fiction and courses on J.R.R. Tolkien. This year I am on research leave and trying to finish four different books (on tradition, Tolkien, grammar and philology; in retrospect, I probably should have worked on one at a time), but I am giving some talks away from campus, including at Bowdoin College in Maine (Oct.) and Washington College in Maryland (April). I'll also be participating in one or more Scholarly Sojourns (more info to follow). If you want to hear Anglo-Saxon, the language of Beowulf (and J.R.R. Tolkien's academic specialization), you can go to Angl0-Saxon Aloud, where I've posted a podcast of every poem in Anglo-Saxon (there are a lot). Some of the favorites are The Wanderer, The Seafarer, The Dream of the Rood, and excerpts from Beowulf. (just ignore the dialogue box; you don't need to give any info). Currently I'm recording and posting the homilies of Wulfstan, who would definitely have had a Sunday morning television show if he were alive today. 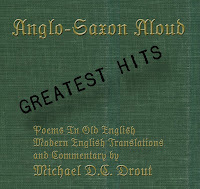 If you like Anglo-Saxon Aloud, you can buy the Anglo-Saxon Aloud: Greatest Hits, which is a two-CD set. This includes the most popular poems both in Old English and Modern English as well as introductory discussions of each poem. 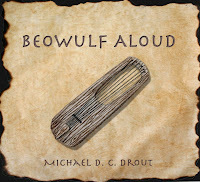 Or, if you like both Anglo-Saxon and Beowulf, I also sell Beowulf Aloud, a 3-CD set that includes the entire poem of Beowulf plus an introductory lecture. If you'd like to learn to read Anglo-Saxon, you can use my on-line grammar book, King Alfred's Grammar. The book is designed to walk you through Old English and does not assume that you already know a lot about grammar. My edition of J.R.R. Tolkien's Beowulf and the Critics is temporarily out of print, but a new edition is at the publisher, so I'm hopeful that will be available soon. My book How Tradition Works is more technical, but, I think, interesting to those who like Anglo-Saxon literature and theories of cultural evolution. My latest course on CD, The Anglo-Saxon World, should be out from Recorded Books' Modern Scholar series any day now. Until that comes out, I have a number of other courses available in the series, including those on Chaucer, Fantasy Literature, Science Fiction, The History of the English Language, Writing and Rhetoric, Approaches to Literature, Grammar (this is actually a really fun course) and Understanding Poetry. Again, thanks for stopping by, and I appreciate any comments, suggestions or criticism. I'm also trying to convince The History Channel that they should do a whole series (or at least a longer show) on Beowulf and/or Anglo-Saxon. If you think that is a good idea, please let them know.